Get Your Android App Indexed By Google! Ever felt the need to open up an app associated with a website and look for something in that app while browsing on your smartphone? You might, for instance, need a list of places on a map application, or perhaps look up a recipe. Switching context from webpages over to applications can be annoying, and might not always give you what you wanted. 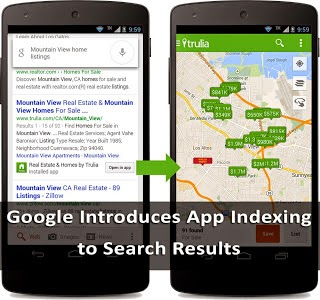 Luckily, Google is here to help - it has finally released the much anticipated app-indexing feature for everyone! 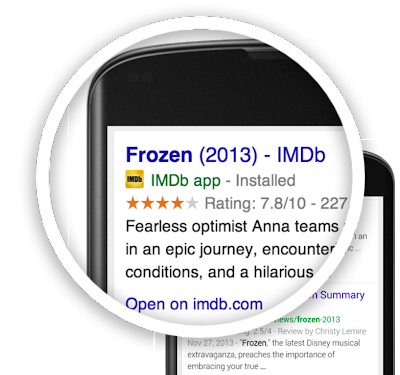 This new feature will help searchers look for information within mobile apps just like they would on websites! If you have an Android app that somehow relates to your website, now's your opportunity to connect the two so that users can find your app content while searching the web on their mobile devices. App deep links in search results help your users find content more easily and re-engage with apps after installing them. As a site owner, you can show your users the right content at the right time — by connecting pages of your website to the relevant parts of your app you control when your users are directed to your app and when they go to your website. A deep link is a link that, when activated, opens up another program to show more relevant data. The concept is often used by Map applications, dictionaries, music players, and so on. App indexing is done through your existing sitemap file, and through Google Webmaster Tools. Again, the process is the same as with a website. Suppose you have set up your sitemap, and your website and app have both been indexed by Google Search. What next? Whenever relevant, Google will then try to show deep links to your app right on the Search Results. Whenever users will search for a keyword and end up with results from your website, they will be shown relevant deep links to your app on the SERPs. When they click on these links, your Android app will launch, and take your users directly to the content they need. Of course, for this to work, they will need to have your app installed on their mobile devices.